Eight scholars from New South Wales attended the 2018 Crawford Fund conference – three supported by our NSW Committee, one supported by Elanco, and two each supported by Charles Sturt University’s Graham Centre and the University of New England. The 2018 Crawford Fund Conference has truly shown the value of nutrition in agricultural systems and inspired me to maintain this theme throughout my professional career. The calibre and experience of the speakers at the conference was staggering. The value of adequate nutrition in regard to public health was expertly laid out by Dr. Demaio and Dr. Fanzo. They both described the ill effects poor nutrition has on a child’s development and the knock-on effects this has on a population. The statistics they presented on the number of people wasted, stunted and undernourished globally were humbling and in truth, quite frightening. These numbers were referred back to throughout the day to further highlight the value of adequate nutrition throughout someone’s life. They both also touched on the societal benefit to a healthy population with education levels, health services and the surrounding environment all benefitting. An excellent example of this is the colossal strain put on health services by non-communicable diseases such as type-2 diabetes, cancer and heart disease. All of which are highly prevalent in ‘western’ populations whose food system is dominated by simple carbohydrates. With the information presented by Dr. Fanzo and Dr. Demaio, it is no surprise then that heart disease is the biggest cause of death in the developed world. Andrew Campbell in his opening of the third session touched on the reason for this massive increase in simple carbohydrate consumption during the post-WW2 green revolution. The direction of agricultural production and research at the time is so perfectly embodied in the common crop breeder’s adage “yield is king”. This essentially meant that the focus on the nutritional worth of agricultural produce was swept aside, diluting the grains with predominantly carbohydrates. The following speakers of the third session, Dr. Okello, Ms Kane-Potaka, and Dr. Wopereis, all addressed this element of nutrient deficiency in diets from different angles. Dr. Okello focused on the importance of meat consumption, outlining the disparity between the developing and developed world. Particularly the gross over-consumption of meat in ‘western’ cultures and under-consumption in developing populations. Ms Kane-Potaka focused on the potential of alternative grains such as sorghum and millets as a nutritious replacement of corn and wheat in undernourished populations, with particular reference to the semi-arid tropics. Dr. Wopereis focused on the role vegetables play in nutrition, and how they provide a readily available source of essential vitamins and minerals. The conference schedule did well to synthesise these differing angles around the importance of nutrition. It provoked us to think about nutrition as an element within the ‘One Health’ framework. It was skillfully articulated that being effective in international development work involves embracing other disciplines and skillsets. In this regard, I found the scholar days and activities particularly valuable. I was able to interact with people with vastly different backgrounds to my own, but all with the same goal. In informal conversations with my mentor, Patricia Lopez, she emphasised the importance of ‘soft’ skills such as the ability to communicate, with particular emphasis on language. 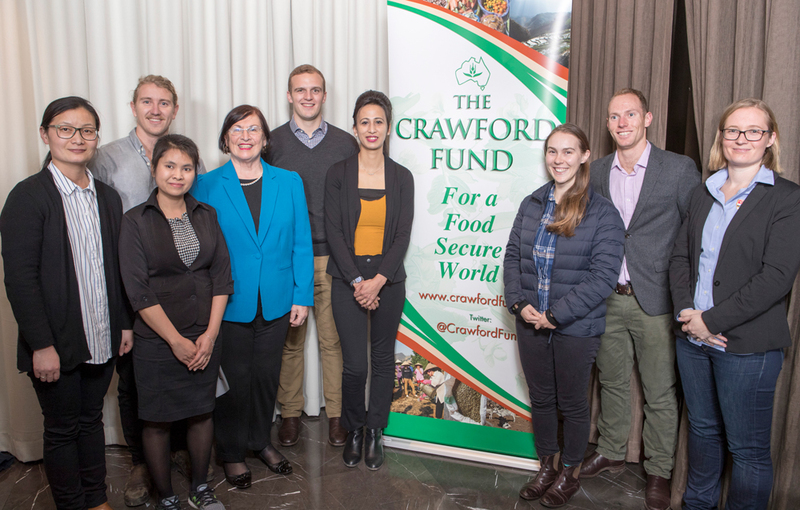 I thoroughly enjoyed the 2018 Crawford Fund Conference and came away with a stronger drive to pursue international agricultural development further. I relished the opportunity to connect with others in this small but vital industry. I returned to Sydney full of inspiration and anticipation for the future. So, I must thank Cathy Reade and the rest of the Crawford Fund team for organising a spectacular 2018 conference, I am immensely grateful for the opportunities you provided. The 2018 Crawford Fund Conference was an excellent experience to meet and network with individuals working in such varying fields. The 2018 conference, “The agriculture, food, nutrition, health nexus” succinctly brought together the current issues facing food and nutrition security. The conference brought attention to ‘hidden hunger’ an issue that has been neglected in the past as well as the debate regarding red meat consumption and the argument for reducing livestock production. Dr Anna Okello, from the Australian Centre for International Agricultural Research highlighted the danger of providing a blanket statement regarding reduction in livestock production. She emphasised the need to consider the context of production systems and the importance livestock production plays in the role of securing household and village level nutrition in developing countries. A/Professor Jessica Fanzo’s impassioned presentation and subsequent Q&A discussion on the burden of malnutrition highlighted the complexities of malnutrition in society. Such as the current obesity epidemic in developed countries, where this tends to affect those of a lower socioeconomic status, and how chronic undernutrition can have generational impacts on the national economy as the individual earning capacity of individuals who are stunted can be reduced by up to 45%. Working in a primarily livestock-based field, I was very interested to learn about the biofortification of cereals that is occurring to try to address the hidden hunger issue as well as learning about the community outreach programs run by large private companies such as the Kellogg corporation. I would have liked to see more discussions on issues such as pesticide and herbicide use in crop production as I feel this is a key issue that needs to be addressed as farmers are trying to produce higher quantities. There was also minimal discussion on utilising fish and insects as protein sources. I feel like some of the speakers recommend substituting red meat consumption with fish-based protein, however the sustainability of fish farming and wild caught fish was not discussed. I enjoyed the opportunity to network with the other scholars and mentors, meeting different scholars working in the bee industry. This is another area of food production that I feel needs much more discussion and consideration in the future. It was great to meet many of the mentors, and hear about how they have progressed their careers, and it was great to hear more personal stories about how they may have managed their families and ‘work-life’ balance in their earlier stages. I am one of the luckier scholars as I already am involved directly in international agricultural research, but it was great hearing about the many ways others have entered in to this field. The advice Professor Robyn Alders provided, especially to the female scholars was valuable, as well as reminding us all that international work is not for all, and you can still make a highly valuable contribution doing work based in Australia. What an inspiring and exciting experience to be selected to join 44 other bright and aspiring young researchers enthusiastic about making positive change in the nexus of international agricultural development! Eminent international and Australian speakers presented impactful, insightful and relevant presentations on reshaping agricultural research for better nutrition in context of global challenges spanning agriculture, food, nutrition, heath. Our mentors were genuinely interested, engaged and keen to introduce us to esteemed agricultural researchers, parliamentary politicians, ministers and renowned CEOs. A highlight was the opportunity to discuss beekeeping projects with ACIAR’s CEO Prof. Andrew Campbell – ‘We have to use all the tools in the toolkit, with good governance, good design, and good risk management’. It was encouraging to learn that agricultural development is a key driver of poverty reduction and that growth in agriculture is 2-3 times more effective at reducing poverty than equivalent amounts of growth generated in other sectors. Thank you to the Crawford Fund and the NSW Committee for the incredible opportunity. I was delighted to be invited as a scholar to participate in the 2018 Crawford Fund conference. I wanted to begin my reflections by thanking Elanco for sponsoring me to have this experience. This year’s theme was “Reshaping agriculture for better nutrition” where it was quickly highlighted that achieving “Zero Hunger” as part of the United Nations sustainable development goals can not only focus on quantity of produce available but nutritional quality and environmental sustainability. In their opening remarks, Dr Alessandro Demaio and Dr Jessica Fanzo echoed a global double burden, where two billion people do not have enough to eat and two billion people are obese: both groups are undernourished. The question was posed: who is to blame for this double burden? Is it the consumer who buys the food, the market who sells it or the government who regulates the sale? In these opening remarks, large corporations (specifically soft drink companies) were particularly targeted for manipulating people into consuming large amounts of their unhealthy products. Regardless of whose “fault” the global epidemic in malnutrition is, it is clear that it will take efforts from the private sector, governments and consumers working together to find solutions. It was interesting to learn that each socioeconomic group globally is not consuming enough vegetables for their nutritional demands, emphasising the need for nutritional education. The discussions at the conference further urged my drive to be part of the solution. What is the role of the veterinary sector in ensuring food AND NUTRITION security for all? I think of our global challenge to feed the growing population. Do previous efforts to intensify systems to improve agricultural yield meet human nutritional demands? I was intrigued to learn about Dr Jessica Bogard and Dr Shamia Chowdhury’s research in Bangladesh where they found that although intensely farmed fish can provide more protein source for the economic cost and return, they contain far less micronutrients than the small indigenous fish species. With growing demand for protein nutrition across developing nations seeing intensification of animal farming systems, will we continue to see a decrease in micronutrients? How will we recognise and combat this before it grows to epidemic scale? The challenge for the veterinary sector is to ensure our stewardship of livestock for human consumption does not compromise nutrition for the population, whilst maintaining standards of animal welfare, transboundary disease security, judicious use of antimicrobials and antiparasitics (just to name a few responsibilities). These may all go hand in hand. Society must change to value nutrition so that today’s investments can be made into systems which produce high quality nutritional food. Whilst these problems can get somewhat overwhelming, I can focus now on what I can change, starting with myself. What am I putting on my own plate? How am I supporting farmers for a sustainable future? Perhaps the highlight of the conference was the swapping of stories from others in the field. It was wonderful to meet with a range of experts from diverse branches of the agricultural development umbrella: dietitians, entomologists, agronomists, livestock sectors, vegetable evangelists, water resource specialists and economists. A term that gets thrown around the veterinary sector a lot came to mind, “One Health”, where the health of people, animals and the environment are symbiotic to each other. It is through these many disciplines that we can achieve zero hunger and nutrition for all whilst ensuring climate stability and sustainability. It goes to show that whilst we talk about “big picture” earth goals, we have only come this far in providing nutrition to people through hard work and efforts on the ground: trials, errors and successes. Finally, I wanted to share my excitement for a project ACIAR has pioneered: linking celebrity chefs with in-country ACIAR projects to celebrate successes with the wider community via a television documentary series. What a wonderful idea to celebrate agriculture with the food that it produces! With thanks to the Graham Centre, I was able to attend The Crawford Fund Scholar Program and The Crawford Fund Annual Conference held in Parliament House. The scholar program brought 44 keen, young researchers together to network and learn of the work conducted by Australians in international agricultural research and development. Each scholar was provided a mentor for the proceeding two days. I was lucky enough to be paired with Peter Wynn, an adjunct Professor of Animal Production at CSU who has a CV longer than I could ever image, with a research background in sheep, dairy and pig physiology and beef and sheep meat production. He is now working on a project in Pakistan; “Improving small holder dairy and beef profitability by enhancing farm production and value chain management” through the University of Melbourne. The scholar day began with a very inspirational speech by the Hon John Anderson AO, chair of the Crawford fund and former deputy PM and a sixth-generation farmer from western NSW. In a time of great hardship for farmers across NSW and QLD, it is easy to call for current politicians to cut funding for international agricultural development and invest it locally, however, as a country, we have an obligation to help our neighbours in the Pacific who don’t have the mechanisms, systems or education to bring them through times of adversity, whether it be drought, salt water intrusion, pest invasion or other challenges faced with a changing climate. Outlined by the Hon Julie Bishop MP, every dollar Australia invests in foreign aid, we receive $7 back in benefit. Half of the cities across the world suffer water scarcity, leading to security issues, and on occasions, outbreak of war, something no country has ever benefitted from. Whilst Australia is the lucky country and we perform well in many areas, we have a lot to learn from overseas nations, shamefully ranking high in the number of endangered species we have and disgracefully, taking out gold for the percentage of overweight and obese citizens. “Reshaping Agriculture for Better Nutrition: The Agriculture, Food, Nutrition, Health Nexus” was the title of the conference held in Parliament House. The conference highlighted the food security issues we are facing globally and the challenges of overcoming these, exacerbated by climate change. These days, more people die from preventable undernutrition than natural disaster and disease, with poor diets the single greatest risk to poor health. Globally, since 1969, we have halved the number of people going to bed hungry, however, food in the belly doesn’t signify proper nutrition. Two billion people are considered malnourished, lacking key micronutrients like iron and vitamin A, 151 million children are stunted and 52 million are wasted, affecting brain development and life expectancy. Simultaneously, 2.1 billion adults and 38 million children are overweight or obese, costing $2 trillion annually. Not one sector of the global society; low, middle, or high-income individuals are consuming near enough calcium, fruit, nuts, vegetables or whole grains that our bodies demand, instead, overconsuming sugar and salt. “Nutrition, along with climate change, is the meta challenge for agriculture and agricultural and food systems” – Andrew Campbell. To tackle the challenge of nutrition, we need to develop and support leaders to exercise political will and acknowledge the complexity and interconnectedness of the food system with greater collaboration between agriculture, aquaculture, water, nutrition, social, cultural and health scientists to achieve a productive, inclusive, healthy, sustainable and resilient food system where nobody is left behind. To do this, all tools in the toolbox need to be used, including biotechnology, with more emphasis on science, not emotions. The conference and scholarship program not only opened my eyes to the severe nutritional issues we are facing, it inspired me and gave ideas about how, upon completion of my Honours in Agricultural Science, to continue post-grad studies and work collaboratively with international and Australian farmers to help solve malnutrition in an environmentally, socially and economically sustainable manner. Attending the Crawford Fund annual conference 2018 in Canberra was such a great and exciting experience for me. I really appreciate the opportunity provided by The Crawford fund and support from my university to attend such an inspiring conference. The theme of this year’s conference, ‘Reshaping agriculture for better nutrition – the agriculture, food, nutrition, health nexus’ has successfully put a bigger picture of international agriculture research improving human health in front of me. Invited international speakers and government bureaucrats gave stimulating talks on this topic linking agriculture research with human health. The discussion on various aspects related to nutrition explored the complex issues human kind is facing globally. The talks by Dr Demaio and Dr Fanzo put the complexity of the global nutrition problem at the start of the conference. Food security and global poverty are problems entomologists try to help solve by reducing pest damage to crops, vegetables, fruits, trees etc. Malnutrition, and hidden hunger are the problems I previously hadn’t thought much about. This was thought provoking for me, as an agriculture researcher, having been focused on improving pest management in a few crop systems I hadn’t previously fully appreciated the link between my work and the global nutrition problem. Glad to hear Prof. Campbell’s presentation in the session ‘How does agriculture respond to the nutrition challenge?’ which suggested agriculture can contribute to nutrition challenge even with difficulty. This session gave encouragement and hope to young scientists to develop and keep the career in agriculture for better nutrition. From these presentations, I think diversified and balanced diets are needed for human health and traditional vegetables, smart food, multi grains etc. need to be brought back on tables more often. There are solutions around! Globally, we need to form a different habit and those who have been doing so are leading the revolution. Education, policies, good habits for better diets need more effort from more sectors in this complex global society. We need a sustainable agriculture for a sustainable eco-system on a green planet. Back home from the Crawford Fund annual conference I kept on thinking scientists focusing on research should broaden their world view rather than focusing solely on their specific discipline. The world really need more multi-disciplinary efforts. The Crawford Fund event also gave opportunities for mixing with scientists and others involved in international agriculture. The two ½ day scholar activities were an excellent experience for me. The mentor and mentee system complemented this by paring ‘old’ scientists with next generation scientists/early career researchers; sharing their experience, success, challenges and tips in global agriculture research. During the activities everyone in the room was so friendly. The environment in the room reflected the attitude of working together for agriculture research which is so welcoming for young scientists/early career scientists. This experience has illuminated the pathway ahead for my international agriculture research adventure, especially to contribute more in developing countries. Thank you to the Crawford Fund, ACIAR, RAID and others involved in these activities. For a long PhD Journey, I need motivation, new knowledge, global theme and networking which is important for my future career. This was a right time for me to attend this year’s Crawford Fund Conference with the title of Relationship Agriculture for Better Nutrition. This conference was an eye-opener in many ways. The conference also highlighted to me that knowledge concerning nutrition plays an important role to be an outstanding people. In many cases, people can’t be recognised between malnutrition and genetic. According to my experience, I am rather short compared with other women and my father explained, that is genetic because my mother and my grandparents were short also. When Dr. Alessandro Demaio demonstrated the nutrition chart recommended by Oxford University, I knew why I am shorter than other people. That is malnutrition and it is the difficult thing to decide malnutrition in developing countries. So, it is the important key issue for future projects for developing countries. It was a pleasure to meet many of the Crawford Fund board members, and the interesting and talented scholars. In particular those scholars who were from developing countries and who were able to share their personal experiences. As a consequence, I was able to meet and build relationships with a wide variety of people involved in agriculture, from undergraduate, master and PhD students, to people working in the private or public sector. I really enjoyed meeting so many people united by their interest in or passion for agriculture and international development. Another interesting and amazing thing to be a scholar of Crawford Fund Conference is meeting with a kindly mentor, Margaret Reid, who was the first female President of the Australian Senate. As I am also a woman, I got a lot of knowledge and valuable experience relating to leadership roles from her. I had a wonderful time with my mentor. Finally, I wish to express my deep gratitude to the Crawford Fund for sponsoring my attendance, RAID for your cosponsoring of many activities and my principal supervisor, Dr. Julian for giving me such a great chance. I am so glad I attended 2018 Crawford Conference and believe that the knowledge I acquired would be beneficial in my future career. It was my great opportunity to participate as a Crawford Fund scholar for this year’s conference that allowed me to think about agriculture and agricultural systems from a different perspective. The existing double burden to the world and need for collaboration and integration of expertise from different fields to meet the mega challenges of this 21st century was the key focus area at this conference. I feel fortunate to have heard talks from leaders in the field that inspired and guided me towards setting new goals and a career path. A lot of areas of international agricultural research were new to me and it was more overwhelming since they were presented by the pioneers in the field. I was not aware of the existing situation of stunting and malnutrition in the world. It was heart wrenching to know that 22% of the world’s children under 5 are stunted both in their bodies and brains. Also new to me, was that not only is there the problem of stunting but also increased problems of obesity and overweight throughout the world, a much more complex situation to deal with. But, I was also glad to know that the experts around the world are working to improve the situation and the percentage of stunting is going down although at a very slow rate. The day was followed by talks about the opportunities and new approaches to the global problem. With the double burden of malnutrition and obesity, it is important to make changes in our feeding system from rice, wheat and maize to new opportunities such as finger millets. The idea of smart food, inclusion of diversity of vegetables with different nutrient contents, and the promotion of traditional vegetables are worth thinking about. It became clear from the talks that it is high time now, to follow the holistic approach but not in a traditional way. We have a system that is not fit for the purpose of 21st century and we need more new ideas. So, we need to start including more diversified experts in the field like policy makers, experts from public health, food technologists, microbiologists and work with sectors that we have not worked with before and adopt new system to meet the bigger challenges that we are facing in the present context. The pairing with my mentor, Dr. Robyn Alders, was like finding a gem for me. Her experiences, her advice on my project and ideas enlightened me more. In addition, I am very much impressed by her valuable contribution to the developing countries. The scholar program where we had such incredible and experienced mentors, with ample networking opportunities and possibilities to connect with people; information regarding international agriculture systems; volunteering options; and, different projects is what I think was a gate opener to new opportunities for all the scholars. The RAID networking event, meeting with volunteers, young scientists from the diversified field, was equally a new platform to build up my network and inspired me to continue working in this field. It was motivating to hear from the RAID people about their experiences, opportunities and future possibilities. Overall, I am very thankful to the Crawford Fund and UNE for providing me the opportunity to attend the conference, network and meet the experts and broaden my horizons in this field. I will be continuing to keep connected with the Crawford Fund, RAID and other scholars, whom I was able to connect so well with.